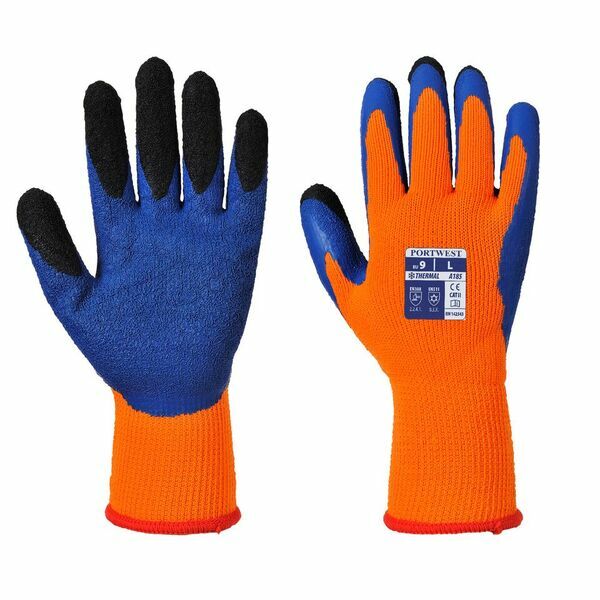 Designed for warmth and protection while working in cold conditions the Portwest Thermal Latex Orange and Blue Gloves A185O4 provide strong grip and high level protection in cold conditions, making them suitable for a diverse range of working environments. The durable and highly resistant the A185O4 gloves offer strong mechanical resistance for protection against rough and coarse materials. The highly adaptable Portwest Thermal Latex Orange and Blue Gloves A185O4 are ideal for cold conditions, while their strong grip and high level protection make them suitable for a variety of situations from bricklaying to scaffolding. The Portwest Thermal Latex Orange and Blue Gloves A185O4 are available in sizes 8- 10.